You may ask yourself now what’s the big deal or what’s wrong with this expression. And you are rightly doing so. There is nothing ‘wrong’ with concede defeat. But a related expression, concede victory, is found troublesome by a few. In my research on the BBC I have come across the ‘usage problem’ of using concede victory instead of concede defeat. The BBC style guide declares the use of “concede defeat” as “wrong” and favours the use of concede victory. Intrigued by this issue, I have decided to see how concede is actually used in the reporting on the referendum vote in the online media. Doing a simple google search for “Salmond concedes defeat” and “Salmond has conceded defeat” results in 4,030 and 412 hits respectively*, while the same search with “Salmond concedes victory” and “Salmond has conceded victory” show a completely different picture. The search including the present tense of concede remained fruitless, while the later search resulted in a meagre 8 hits. What was striking from these results is not only the low numbers for concede victory, but also the fact that concede victory does not seem to be a British problem. It was found only on the Irish RTE.com and wn.com homepages**. This is surprising as I was expecting to find some results from the BBC News homepage. What does the BBC use then? Have they changed their mind about the use of concede victory? The OED states in his entry on concede that concede means to admit defeat, to acknowledge that an election is lost. If you take the search further and investigate the BNC, you will see the same pattern as in the online media search. Concede defeat occurs more frequently than concede victory. 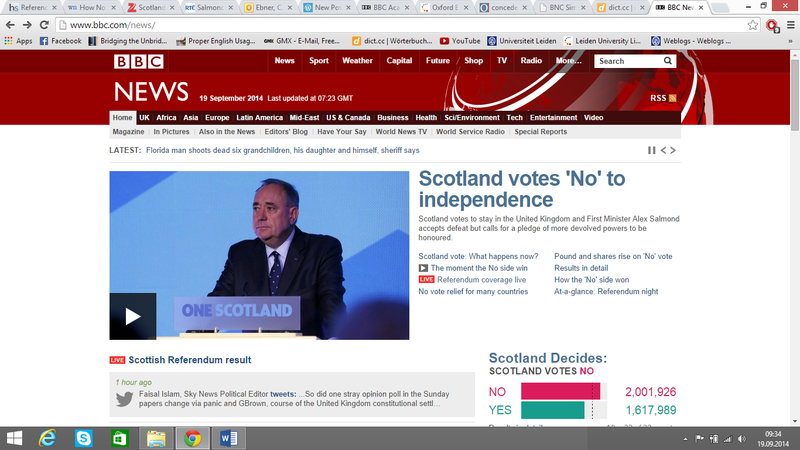 A simple glance at the BBC homepage instantly answers the question concerning the BBC’s stance on concede. Instead of using concede altogether, the journalist smartly used accept defeat. The BBC style guide also advises on this usage in order to avoid “the problem”. It seems that the BBC is aware of the controversy about the use of concede victory, which still raises the follwowing questions. Why does the BBC advises its journalists to use concede victory if concede defeat is more frequently used? Is the BBC fighting a long lost cause? * Google searches were conducted in the morning of the 19/9/2014, so the numbers of hits are subject to change. ** wn.com: Shows results in google search, but cannot be retrieved from the news provider itself. This entry was posted in usage features and tagged BBC, British English, concede, defeat, media, Scotland, usage problem, victory, vote, wrong. Bookmark the permalink. 3 Responses to A lost cause? It seems pretty obvious that the BBC is indeed fighting a lost battle. Looking at the use of concede defeat and concede victory with Google Ngrams, I get the same pattern, with concede defeat occurring about 10 times as often as concede victory. Actual ratios vary depending on the exact form of the verb (person & tense) and depending on whether you look at British or American English (AmE has slightly higher average ratios). In addition, all Ngrams (for different tenses, conjugations and language varieties) show that the ratios of concede defeat / concede victory” have been increasing for more than a century. Perhaps the BBC Styleguide anticipated a trend which has not panned out in the way they thought it would. However, this attitude would betray a serious oversight regarding the historical development I mentioned. They seem to be on firmer ground, however, in advising the use of the alternative admit defeat, which compared to concede defeat with Google Ngrams, occurs about twice as often. It is possible that the BBC Styleguide advocates concede victory, despite it being a minority use because there is no alternative wording available (admit victory is not used), such as there is for concede defeat. Thank you for the comment! I did check Google Ngrams for the blog post as well and there is clearly no doubt about this pattern. I am, however, still puzzled by the BBC stating explicitly that the use of “concede defeat” is wrong.